Triadic Memories requires contemplation, listening without restlessness. 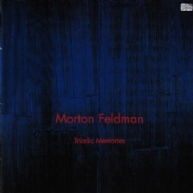 Though perhaps not intended by Feldman, a strong contemplative element is inherent particularly in this composition, settling like a haze on the tones that seep in slowly – whether alone or in chords – until only the pure sounds remain. "For me, sound is the most important thing. I feel that I am subordinate to it. I feel that I listen to my sounds, and I do what they tell me, but not what I could tell them. Because I owe my life to these sounds; they gave me a life." (Feldman) He weaves his sounds slowly, in loose and seemingly endless patterns that are incredibly difficult to perform in all their deeply fissured complexity. Markus Hinterhäuser continues to astonish his listeners by the way he masters this act of concentration, like he does once again in this brilliant recording. Markus Hinterhäuser shows us a terrific interpretation of the piano sonatas from the russian composer. Massive music! Music and carpets? Well, the latter’s slightly irregular patterns certainly inspired Morton Feldman to write his Crippled Symmetry (1983).